S p e c i a l t y T i r e s M T D J u n e 2 0 1 8 44 Up to 70% of trucks on the road are misaligned, creating a modern-day gold rush for alignment service providers. Dealers are earning up to $12,600 profit in the first month alone. 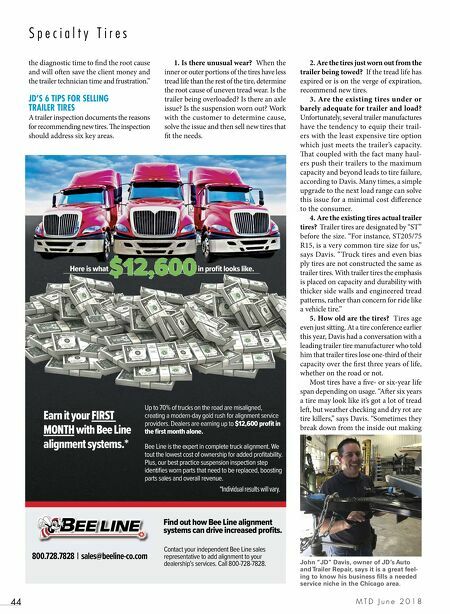 Bee Line is the expert in complete truck alignment. We tout the lowest cost of ownership for added profitability. Plus, our best practice suspension inspection step identifies worn parts that need to be replaced, boosting parts sales and overall revenue. Earn it your FIRST MONTH with Bee Line alignment systems. * *Individual results will vary. 800.728.7828 | sales@beeline-co.com Find out how Bee Line alignment systems can drive increased profits. Contact your independent Bee Line sales representative to add alignment to your dealership's services. Call 800-728-7828. 2. Are the tires just worn out from the trailer being towed? If the tread life has expired or is on the verge of expiration, recommend new tires. 3. Are the existing tires under or barely adequate for trailer and load? Unfortunately, several trailer manufactures have the tendency to equip their trail- ers with the least expensive tire option which just meets the trailer's capacity. at coupled with the fact many haul- ers push their trailers to the maximum capacity and beyond leads to tire failure, according to Davis. Many times, a simple upgrade to the next load range can solve this issue for a minimal cost difference to the consumer. 4. Are the existing tires actual trailer tires? Trailer tires are designated by "ST" before the size. "For instance, ST205/75 R15, is a very common tire size for us," says Davis. "Truck tires and even bias ply tires are not constructed the same as trailer tires. With trailer tires the emphasis is placed on capacity and durability with thicker side walls and engineered tread patterns, rather than concern for ride like a vehicle tire." 5. How old are the tires? Tires age even just sitting. 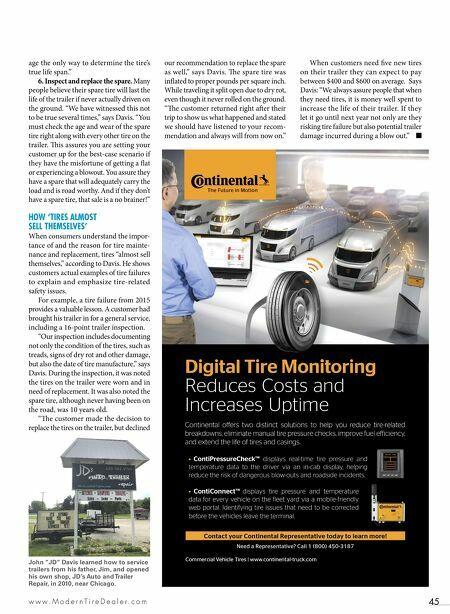 At a tire conference earlier this year, Davis had a conversation with a leading trailer tire manufacturer who told him that trailer tires lose one-third of their capacity over the first three years of life, whether on the road or not. Most tires have a five- or six-year life span depending on usage. "Aer six years a tire may look like it's got a lot of tread le, but weather checking and dry rot are tire killers," says Davis. "Sometimes they break down from the inside out making 1. Is there unusual wear? When the inner or outer portions of the tires have less tread life than the rest of the tire, determine the root cause of uneven tread wear. Is the trailer being overloaded? Is there an axle issue? Is the suspension worn out? Work with the customer to determine cause, solve the issue and then sell new tires that fit the needs. the diagnostic time to find the root cause and will oen save the client money and the trailer technician time and frustration." JD'S 6 TIPS FOR SELLING TRAILER TIRES A trailer inspection documents the reasons for recommending new tires. e inspection should address six key areas. John "JD" Davis, owner of JD's Auto and Trailer Repair, says it is a great feel- ing to know his business fills a needed service niche in the Chicago area.